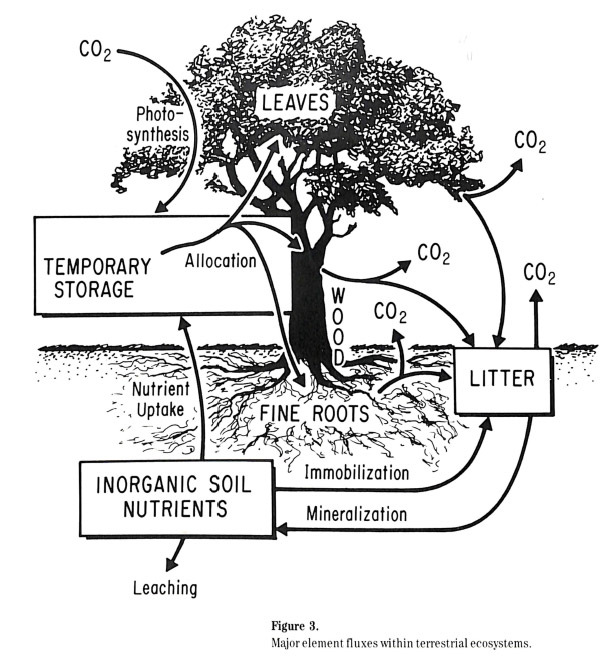 One of the first Ecosystems Center projects was called the Global Carbon Cycle project. Grants from the US National Science Foundation (NSF) and the Department of Energy funded the Global Carbon Cycle project over a number of years, such as the NSF grant “The world carbon budget: An analysis through modeling” for July 1978 through June 1980. This project involved many researchers, including: George Woodwell, John Hobbie, Bruce Peterson, Jerry Melillo, Gaius “Gus” Shaver, and Richard “Skee” Houghton from the Ecosystems Center and Berrien Moore from the University of New Hampshire. Scientists knew that fossil fuels and deforestation added most of the carbon dioxide to the atmosphere, thus changing the global carbon cycle. But there were disagreements about how much just how much of an impact deforestation caused. Some scientists who studied climate change thought that forests were not important at all; others thought that forests absorbed more carbon dioxide than deforestation released. According to a former post-doctoral student at the Marine Biological Laboratory, a debate between ecologist George Woodwell and Wallace Broecker, who studied ocean systems, led the audience to throw insults such as “leaf counter” and “geochemical fool.” While ecologists such as Woodwell saw the potential of recent large-scale deforestation to add more carbon dioxide to the atmosphere, geochemists used different mathematical models that showed forests should store more carbon than they released. This debate has led to collaboration to study the main drivers of the global carbon cycle. Researchers at the Ecosystems Center set out to study the flow of carbon to and from terrestrial ecosystems. They used techniques such as mathematical models to help aggregate data on a large scale. Depending on how they are designed, computer mathematical can help explain and predict the carbon cycle of ecosystems. These models rely on a variety of data sources, such as information about the type of vegetation on a patch of land, collected over many years and on many other patches of land. Data collected by satellites can also be used in these types of models.